Personality is an unsolved puzzle, and Jungian typology is but a tiny piece of that puzzle. It says something about the arrangement of the four functions and their orientations. All sorts of other factors that pertain to the personality are, in effect, irrelevant to the system. 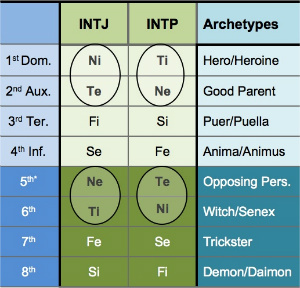 Even if you know everything about Jungian typology you will still fail if you don’t know anything about any other aspects of personality. You will suffer from a sort of psychological myopia where you attempt to cram everything you observe into type. But as type is just one piece of the puzzle you will also observe some things that do not pertain to type, and if you don’t know what these other traits are, they will cloud your assessment of type. Nobody in the history of Jungian typology has ever always been right, and no one ever will be. As you can see on our News page, we revise our work and give credit to the people who correct us. Jung also changed his typings over time, as we have documented on this site (for examples see Jung on Nietzsche / Jung on Freud / Jung on Jung). Keirsey has changed his assessments of people’s types numerous times (e.g. Bill Gates from ENTJ to INTJ and Martin Luther King from ENFJ to ENFP). And finally, Peter B. Myers was ostensibly typed incorrectly by the Myers-Briggs family. Everyone makes mistakes, so don’t be afraid to admit yours – it will make you better in the long run! There is a serious downside to any debates about type. Even sensible people will get dragged into the alphabet soup so that the whole argument gets reduced to a twist over four little letters. When people see someone typing someone as the same four letters as they themselves have decided that a person is, they get excited and sympathetic, and when other people type one or more of these four letters differently, they get dismissive and arrogant about it. If such debates are conducted amongst intelligent people, there are usually several true and important points on both sides. In fact, you can often learn more from an intelligent person who disagrees with you than from someone who merely pats your back. Yet what typically happens when people discuss type on the internet is that each party feels that he is completely correct and that the other party doesn’t listen or doesn’t “get it.” People tend to have strong emotional investments in their typings, and actual arguments for and against tend to take a back seat to just tightly clutching those four little letters. Since you need to respect well-argued criticism, this also means that you need to argue your own points if you want to convince others. Of course, nobody can take away from you what type you think that somebody is, but expecting your judgment to stand on its own in an argument is arrogance. Saying that someone is “obviously” a certain type is really no better saying that you don’t have any actual arguments for why your assessment is the correct one. Many people seem to subconsciously think that figuring out the type of a given person is all that there is to the job. They then get frustrated when others disagree with their conclusion, and they fall back on ploys like saying that their conclusion will be “obvious” to “anyone who does their research” and who “knows what they are talking about.” Again, these are really not arguments, but more like the verbal equivalent of banging your chest. As the scientist Mario Bunge has said, you should always aim to subject your assumptions to tough tests rather than to soft ones. When you are satisfied with a certain typing simply because that typing makes sense to you, you are really saying that you are satisfied with a soft test. What characterizes a good and inclusive community, where people feel like they want to contribute, is an environment where credit is openly given and openly acknowledged. Inspiration is when you use something that was originally intended for a different purpose for a new purpose. For example, somebody writes a piece about how Donald Trump acts in business, and you use that work in your own piece on why you think Donald Trump is ESTP. Plagiarism is when you use something for the same purpose that the original author used it for. For example, somebody writes a piece on why they think Donald Trump is ESTP and you use their work in your own piece on why you think Donald Trump is ESTP without giving credit. You should still give credit to the original author in both cases. But in the second example, the lack of credit is especially dishonorable and only serves to drag you down, as well as dragging down the status of the field as a whole. In this field, it is unfortunately very common for people to pass off other people’s work as their own, with no credit to the original source. But you can easily give credit to others without diminishing your own work. For example, the article that you are presently reading was inspired by the popular graphic “Rules of a Scientist’s Life” that can be found here. In our articles section we have cited everyone from Jung, to Keirsey, to Myers approvingly, even when we disagree with them on other things. On our News page, we revise our work and give credit to the people who correct us. And when people have corrections and insightful comments for our articles, we revise the articles with credit to the commenter. But unfortunately, apart from a few pleasant exceptions, we are rather alone in this field when we try to give credit where credit is due. All too often, people will knock everyone else in the field, claiming that they themselves “only learned from Jung,” even as they indulge in antics from Myers and Keirsey that are nowhere to be found in Jung. There really is no good reason for this culture of non-acknowledgment. Giving credit to others will only make your own contributions stand out more. Amongst the people who are attracted to Jungian typology there are two camps: There are those who want to use it to complicate our world and add new nuances to it, and then there are those who want to use typology to tidy up our world and make it neat. Both of these pursuits are legitimate uses of Jungian typology. The problem arises when the people in the ‘tidying up’ camp start to want easy answers to everything. Again, wanting to ‘tidy up’ is perfectly legitimate. We at CelebrityTypes regard ourselves as belonging to the ‘tidying up’ faction, and we don’t use eight function-models, shadow functions, archetypes and the like. But the problem arises with our subject matter: As Einstein said, a thing should be made as simple as possible, but no simpler. And the human personality is not so simple. Still, there will always be followers and leaders; strong personalities will attract fans and con men will attract suckers. Some of the people who dabble in typology do so because they want an intellectual crutch that can help them explain everything in simple, black/white terms. Likewise, there are many young people who have not yet freed themselves from the last reins of parental guidance and are still seeking a strong personality to show them the way. So don’t follow the “gurus” and “masters” out there. If you have to interact with them, beat them down until they, too, follow the points that are outlined in this post and they actually take care to argue their claims. Like the Buddhists say, “if you actually meet the Buddha, kill him!” The “masters” may be entertaining and haughty, but that is not the same as being right. It may seem ironic that we thus close with an admonition after having just told people not to follow authority, but to our minds, the points that are listed above are not representative of any “master” or “school” – they are simply the steps that we all have to take towards creating a better typing community. These criteria are not just applicable to the typing community, but to any other intellectual community. These criteria tap into something universal, with the examples for each of the six steps being the distinguishing factor. And also, I have created an account at Personality Cafe in the hopes of discussing typology with others. The forum there isn’t as hopeless as I thought, as a considerable number of people there follow some or all the steps. It’s those few people who discriminate by type, use the simplified system without the functions or act haughty which give a bad impression. I didn’t find the author listed here (maybe my problem, in which case kindly overlook this fault). I am not a professional psychologist, but please don’t let that prevent you from reading what follows. From your article, I can see your clear disagreement with authority. Which I must say I share myself. However, not everybody does so (especially not SJ types – I am not part of the SJ preference league but I couldn’t bear to see Si so under-represented). And in fact, good things do come out of following an authority figure (not all of them need be bad at what they do). Perhaps your own type(preference) has conferred you with this bias (and something which I share too). Whichever way, some people genuinely work by putting their trust on an authority figure, they do not trust themselves, they are constantly in doubt of their own conclusions, and they see that trusting an external authority (which has a track record) is not dumb-founded. In conclusion, I doubt that in creating a grandiose decree, your own preferences have foreshadowed the preferences of a clear majority. So is the writer of this essay a very loving and conservative INTP? I do not agree with many of the statements made in this article, despite the fact overall the essential spirit of the idea itself is what might create another chain of events so that a miracle could happen in terms of an actual practice of typing. Si as a function is overly developed as a personality’s aspiration to achieve a higher status of knowing what a mystery form of love is, Ne as a conceptual flow of ideals is being spread across the surfaces of the statements themselves, in order to achieve the primary aim of the only overruling function of Ti, which seems to be wishing for a time of a future’s day when, after all is said and done, it could fly back to a dark night’s higher star with the ashes of the cooling mass which is the lower horizon itself forming a statement which is an accomplishment without regret. From your website, one could easily get the essential idea that, in order to correctly type one individual from others, the only logical means is to identify the functional order as existing from the statements made by this very individual, who however might not wish to copy already existing conceptual meanings from elsewhere too constantly, or else the typing effort might still fail. For a few celebrity figures however, something from your typing effort still does not look too right, such as an obvious example of Oprah Winfrey, whose spiritual orientation might be one to reach out to the mass in order to see a fulfilment of a hidden structural meaning as being perceived by herself from the personal past, whose however secondary or auxiliary function almost definitely is Si, instead of a mystery fantasy oriented Ni, which does not seem to be present all of the time from even most of the media appearances. By analyzing her way of storing information, one by reading her own statements might know that it always comes from a secret location with the exact image from the past, where the connections among objects could only be a motion which is for a classical view to be obtained within first, before this view itself becomes a judging standards for her role to fulfill an Fe purpose in the outside world. This hidden judging function is so stable and conservative, without any sense of a secret pattern connection and mystery that it is a shocking experience to see, most of the “typists” from all corners of the world seem to view her either as ENFP or ENFJ, as if she definitely by wishing for a slightly different life goal herself, already is an idealist. The entire world itself might be another form of a mystery, the truth of cognitive function is not to be understood too easily and without mental and spiritual resistance by the unwilling mass, who primarily only wish to see MBTI as even another random sign horoscope “science” already. As souls might not even originally belong to this Earth itself, they might not also have an origin after the cessation of the lifetime continuation, this hidden clue from the theories of Carl Jung however might not be right still, as concerning how science could still methodologically provide a best answer to the mystery and a long lasting doubt. Most human beings, however, might not wish to accept the hidden side of the reality which is seen and partially understood by Carl Jung, for the very reason that whereas the celestial insight always seeks the truth, they only wish to be down to the deepest bottom of the Earth and see random horizons. Besides, there is a wish on my part to express the opinion that, it looks as if the entire “MBTI” community is rather ignorant of the fact, that in terms of an accurate typing effort, a scientific method must be put in place to ensure that no typing effort could fail to recognize the basic and fundamental fact human behaviors and speeches, are to be analyzed on a constant and basic level, taking into account of the fact cognitive functions are guiding the flow of conscious and thoughts at all time. Your website and analysis method are an exception to the norm, where basic structure of a functioning psyche is being given a primary focus so as to know the hidden truth as if it always will not be hidden any longer, while personal and genuine speeches made by different individuals are to become a foundation for a continuous typing effort. However you might have failed to recognize still one basic and vitally important fact, which is that the speeches made by any specific individual have to be analyzed not exclusively in terms of a suggested meaning alone, they would have to become separate meaningful parts and a connected congruent whole repeatedly again in order to reveal the true functional system used by the very individual being analyzed for the moment, which is the revealed meaning of how different cognitive functions are at work in a perfect order which is in line with the hierarchical theory. It has been successfully shown in the past, that the search for the evidence of cognitive functioning orders from any targeted individual could be the review of as many as even only one statement made by the individual, often times however a 5-minute speech is required to meticulously understand the exact implication of all functioning syntaxes to ensure a correct typing result. A very easy way to accomplish this is to discover a series of statements made by a specific individual, or find one interview video involving himself or herself making personal statements, so that the process can start to review the revealed meanings through the continuous flow of ideas from the statements themselves. When it starts, the first requirement is to see oneself as making the actual statements, “feeling” the flow of ideas deeply, so that separate units of the made statements could reveal the exact functional processes, such as Ne, Se, or Si. Later one has to stop feeling, and begin to think very hard on the implication of all the meanings connected as a whole again, as to discover the missing information which is obtained through the previous feeling process of the entire analysis session. The more or less “more accurate” or simply accurate results of the typing of celebrity figures from your website, might seem to reveal that a certain percentage of them still are given a wrong type, with the statements made only to show a random philosophical or spiritual orientation for a personal lifestyle maintaining or changing purpose, which however are even indicative of a completely different true typing result. Such as Adolf Hitler being ISFJ, Barack Obama INFJ, Carl Jung ENFJ, Mahatma Gandhi ENFJ, and Thomas Jefferson ISFP, for a few notable examples. For Adolf Hitler especially almost all statements made by himself reveal the functions of Si, Fe, Ti, and Ne, especially the dominant function Si even is the very hidden meaning of all statements, only aiming to achieve another “classical image” from the inner psyche where another conceptual connection might remain the same as before or change to the external future depending on the judging criteria of the “deep sense” view sphere. The same is true for others such as Carl Jung, whose main intention of all statements made including even those from his articles aim to discover an external feeling sphere where ideas could be still or shift according to a mythical criterion from another time and space. Thomas Jefferson is the most light-hearted yet intellectually serious scholar from the earlier time, everything his psyche’s mental focus wishes to “see an arrangement of” in the external world is that of an obvious Se purpose, where however Se might even wish to take and grab vague concepts and theories to describe various situations, from a mental screen which still is the realm of the concrete Se. It is right for your website and a few others to type Carey Mulligan as a both “hidden and not hidden” INFJ, for herself however all the statements made only easily enable a set of functions to be known, such as a main introvert tendency, Fe, and a suppressed Se, whereas the actual dominant function seems too much like a “silly image seer,” where ideas from one image could become the transformed trends for another one, which is a sub-type of Ni in functional mode that is hard to detect. Hope that the effort will continue to ensure a more accurate typing in the future, whereas the wrong tendencies from the mainstream could cease to exist, only knowing the unimportant and superficial, leaving out the true and fundamental.